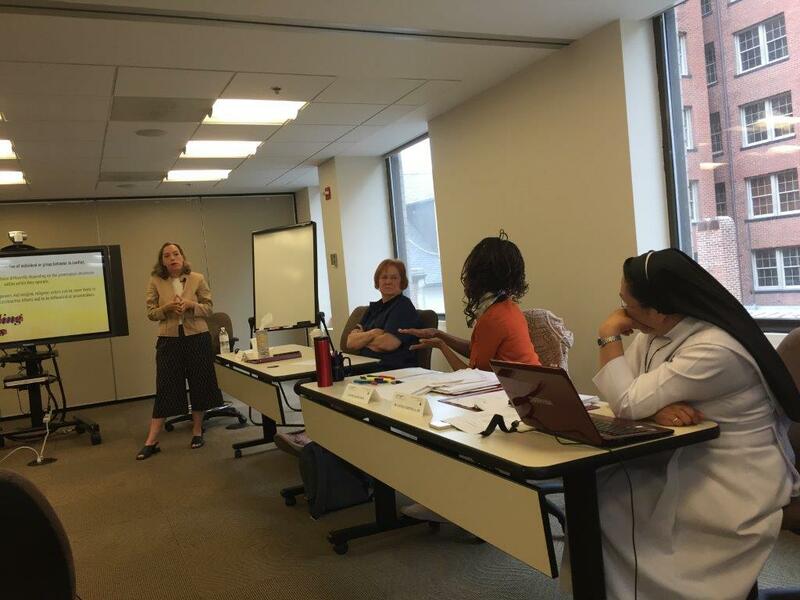 ​The CWFL Fellowship Program is an innovative 2-year program that offers women of faith the opportunity to increase their capacity and leadership skills, in order to more fully address religious freedom, conflict resolution, and peacebuilding in their own contexts. Fellows will learn from one another, and from a network of experts, in order to enhance their leadership, cross-cultural communication, and negotiation skills, while leveraging their expertise and networks to more effectively influence and educate multiple audiences and stakeholders. CWFL will be accepting applications for the next Fellowship cohort in October 2018. Please check back closer to the date for information about the application process. Click here to read the 2015-2016 CWFL Fellowship Impact Report. "I believe that I will receive good friendship, support and educative for improvement purpose. My dream is to build a lasting cross cultural relationship that will help build my capacities and bring about positive changes in the peace building process in my country Nigeria through effective communication with the entire members of these fellowship." "While today's ongoing violence may discourage any signs of long-term reconciliation, I believe that change begins with me. Whether such transformation leads me to strengthening faith resilience in women communities through local mentorship, or capturing oral history to heal past wounds and prevent future revenge, my primary goals for the 2017-2018 fellowship are enclosed in one word: P.A.T.H. Passing on the Torch of Healing (and Reconciliation)." ​"There are hundreds of young women like myself all around the world from a range of diverse backgrounds who all have the same vision and goals of making a difference in their communities. Through this fellowship, I hope to meet some of these women, discover how they are creating change and learning and sharing ideas, best practices and expertise." "Given this kind of training and exposure I think the best way for me to express gratitude is to "pay forward". What we learn should not only benefit myself but it is a must that I will is also share to others. I should continue getting involved in projects and programs that will empower women to become respected leaders in their own capacity." "I am convinced that doors open when it is time for me to walk through them and I think this is an opportunity for me to build upon my experiences and provide leadership for our global community. I use the term "community" to designate the importance of being in relationship with." "I hope to learn from others and from the network of experts, in order to enhance my leadership, cross-cultural communication, and negotiation skills. Through this fellowship I am looking forward to be experienced and equipped to be difference makers both in analyzing problems and implementing practical solutions." "If given the chance to learn and gain the capacity to impact global affairs that relate to China, my influence could leave a much bigger impact on the way we view their government and, more importantly, on the decisions China and the world makes in terms of minority/human rights." I'm working on the translation of the book by Prof. Jasser Auda "Maqasid al-Shariah as Philosophy of Islamic Law" into Uzbek language. It will be first book on Philosophy of Islamic Law in Uzbek language. I published a book in uzbek language last year about fake salafizm (in Central Asia) and attempted to show the attitude based on works of scholars of Ahl al-Sunna wal-Jamaah to some mischievous claims of false salafism. The book is in the form of question and answer that can easily help the reader on the issues of interest. I finished the translation of this book into English and would like to publish it in the US. It would be a great opportunity for me to get feedback from US scholars and of course this research would show American scholars at least the problems related with Islam in Central Asia and the position of Uzbek scholars towards ongoing problems in this sphere.